The past couple of weeks have been brutal with the heat. Ten minutes to set up a "pop up canopy" and then I had to take a shower. Don't get me wrong, I prefer the dog days of summer than the stuck in my house snow days. 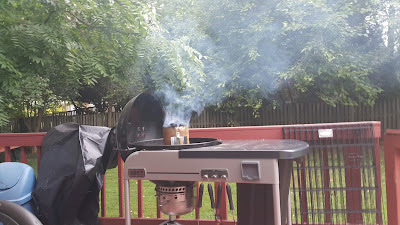 Today it is a little cooler in the early evening and I have fired up the grill. Going to make some burgers and brats for dinner. This is harder to do in the winter. Here is a picture of a chimney for the charcoal. If you are a fan of cooking with charcoal, I certianly am, then you should invest in one if these contraptions. No lighter fluid required.